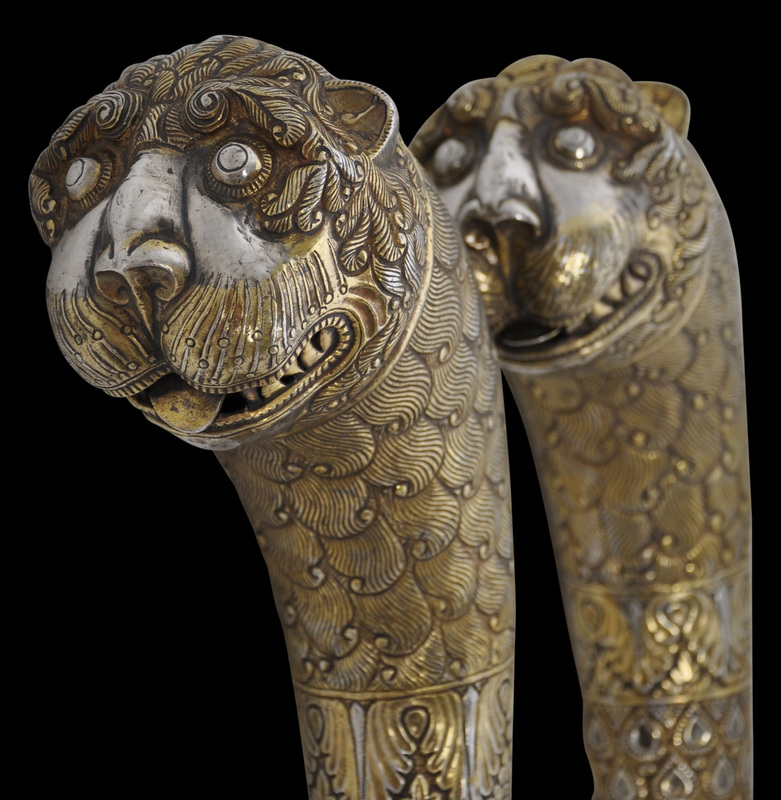 This exceptional pair of mounted, gilded silver ceremonial sceptres are the finest examples we have seen. 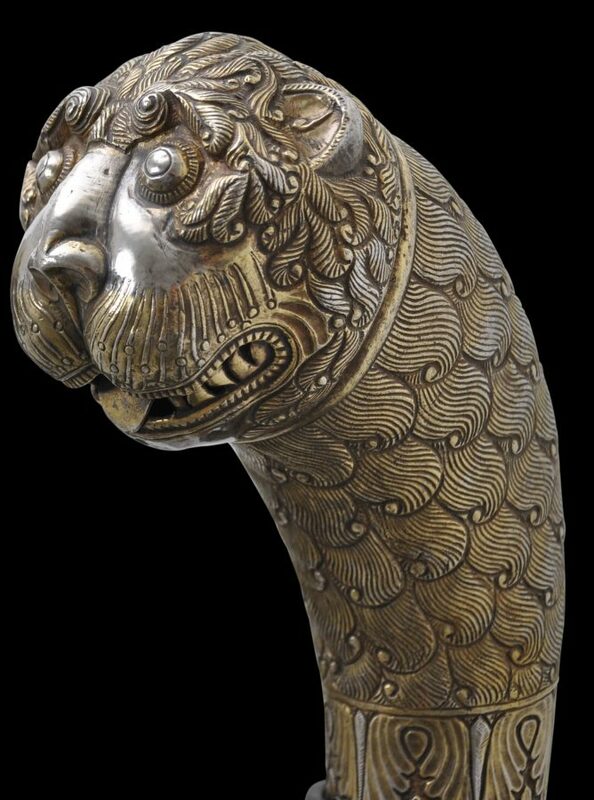 Hugely sculptural and with tremendous presence, they would have been a part of an Indian maharaja’s regalia (called, according to Jackson & Jaffer, 2009, p. 82, lawajama in north India and biruthus in South India). 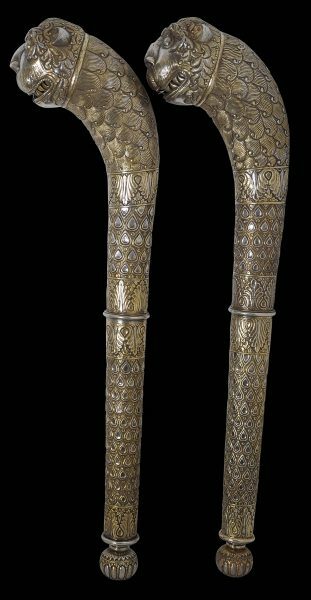 Such sceptres were used in pairs and would have been held aloft by courtiers as they walked beside or behind the ruler when in procession. Sceptres have been an integral part of court regalia in many cultures since ancient times. In the Indian context, sceptres (also known as soutas or sountas in the Indian context), fly whisks and standards were essential components of courtly processions and ceremonies. The presence of such accouterments indicated the status of the enthroned ruler. According to Terlinden (1987, p. 64), each carrier of a sceptre was known as asoonta berdar. Such a man would have been well versed in court etiquette and whilst in attendance in an audience or throne room, would have assisted in closing and opening doors, announcing the approach of visitors and conducting them to the presence. Many were well rewarded for their services, often with special land grants. 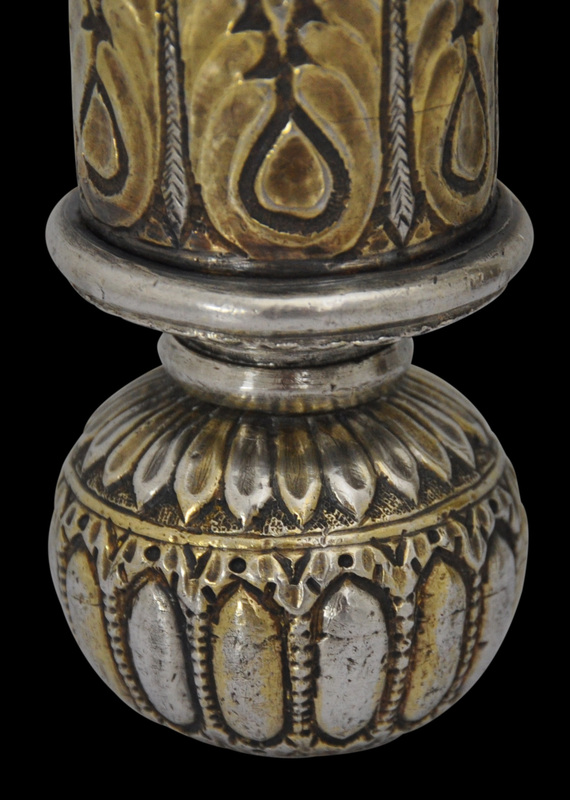 The examples here comprise hammered, chased and repoussed thick solid silver sheet over wooden cores. 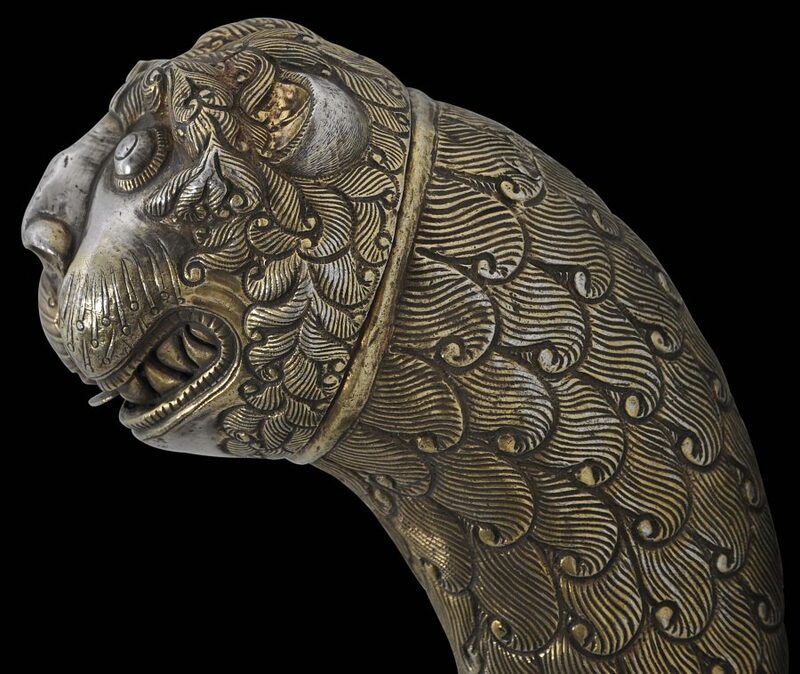 The silver has been partly gilded or gold plated, providing a pleasing contrast between the (mostly) gilded sections and those of plain silver. Each of the main finials is in the form of a regal lion with a long mane of short, fine curls; bared teeth; bulbous eyes; fine parcel-gilt whiskers; and a protruding tongue. Bromberg (2013, p. 117) suggests that such features in relation to a single sceptre in the Dallas Museum of Art are suggestive of a Deccan provenance. 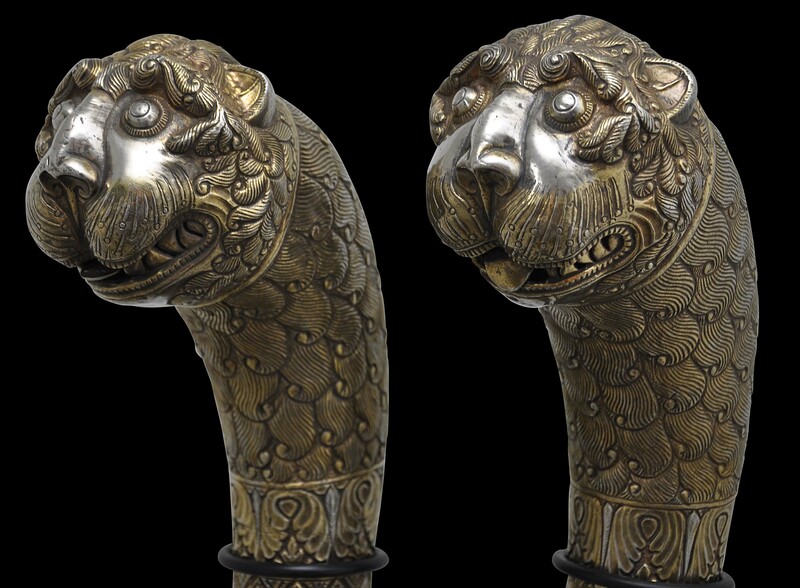 Each of the grips tapers to a spherical end finial, and the grips themselves are decorated with arrays of tear-drop depressions designed to shimmer like costly, flat-cut diamonds, against a ring-mat background. Such a device is associated with the Mughals and with their silverwork of the 17th and 18th centuries. An eighteenth century set of pandan boxes and trays, rosewater sprinklers and scent holders in the Clive Collection at Powis Castle is decorated in the same fashion (see Zebrowski, 1997, p. 48, and Archeret al, 1987, p. 58) for example. The decoration is enhance with various borders of well-executed acanthus leaves. Click here to see a related, though less elaborate and arguably less pleasing pair sold at Christie’s London in 2011. See also Jackson & Jaffer (2009, p. 83) for a single silver-clad sceptre from the ruling Mewar house of Udaipur. 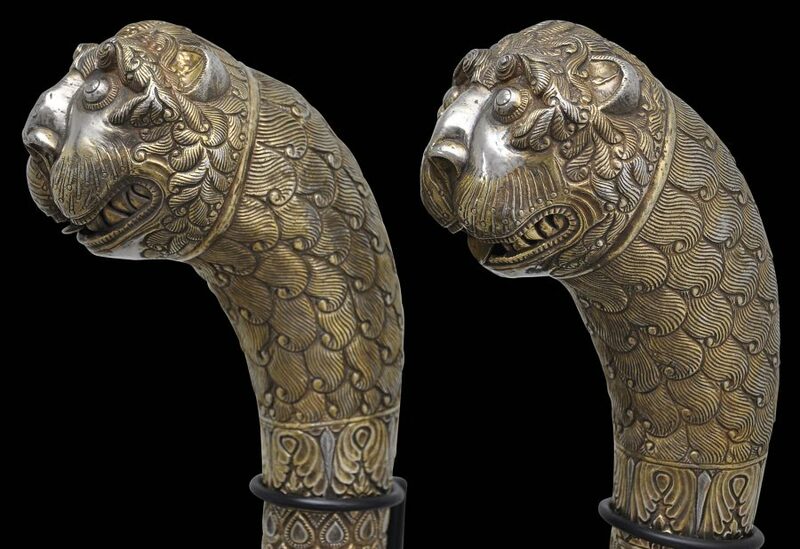 The sceptres are in excellent condition. 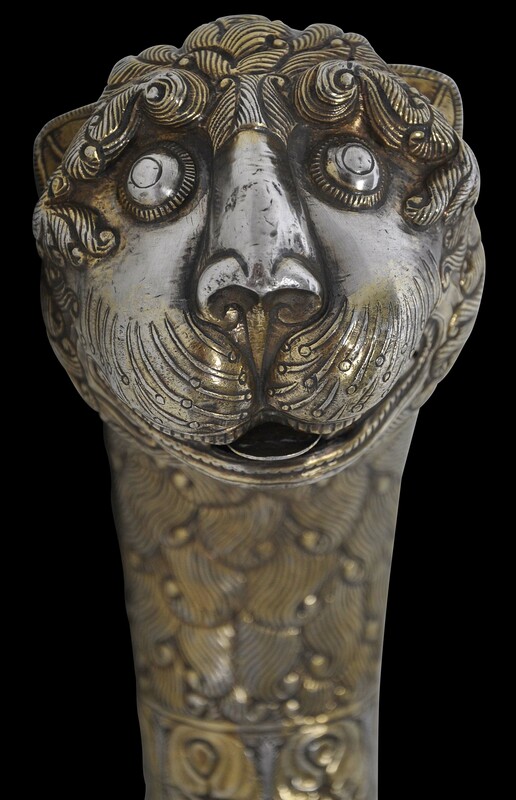 There is some invisible restoration to the silverwork, to the lower end finial of one. The gilding has adopted a soft, beautifully aged hue. They are mounted on separate, custom-made black metal stands. They slide in and out of the stands freely – they are not fixed to them. They stand upright when in their stands and are enormously sculptural with tremendous presence. They are among the finest example of their type. Bromberg, A.,e t al., The Arts of India, Southeast Asia, and the Himalayas: At the Dallas Museum of Art, Yale University Press, 2013. 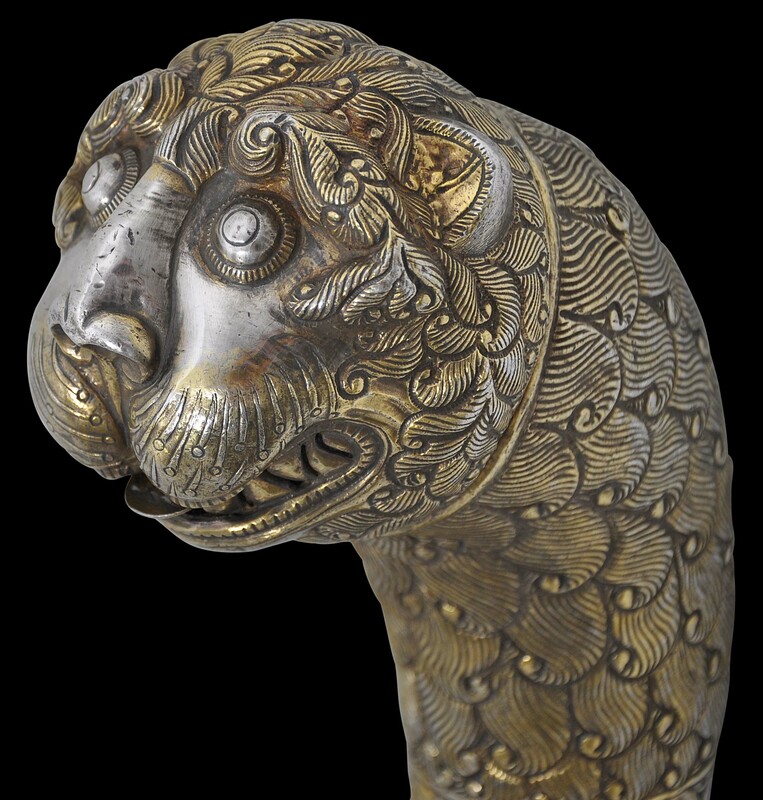 Terlinden, C., Mughal Silver Magnificence,Antalga, 1987.